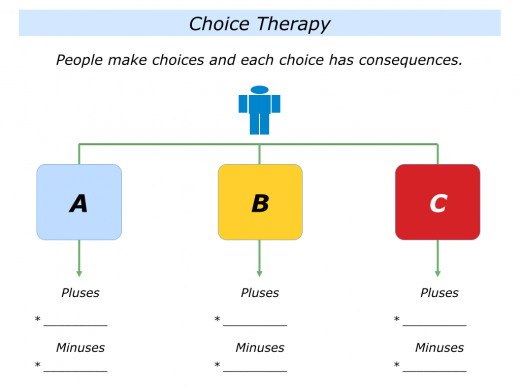 This article provides an introduction to Choice Therapy. Such an approach is strongly influenced by existential psychology, reality therapy, logotherapy and the work of some self help groups. This piece shows how a practitioner might facilitate such a session. Choice therapy, like all therapy, is based on certain assumptions about people. These involve treating people like responsible adults and pursuing the following guidelines. Let’s imagine you have had several years experience practicing this approach. Here is a snapshot of how you might facilitate such a session. One disclaimer. 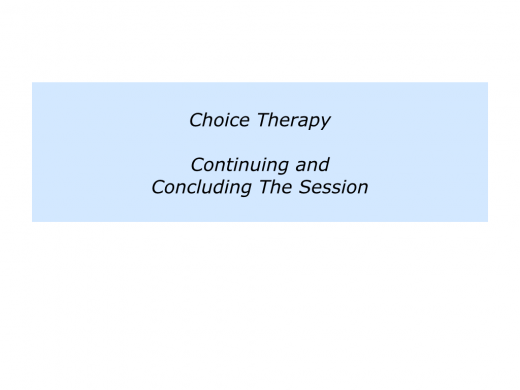 The article gives an overview of how someone can facilitate such a session. 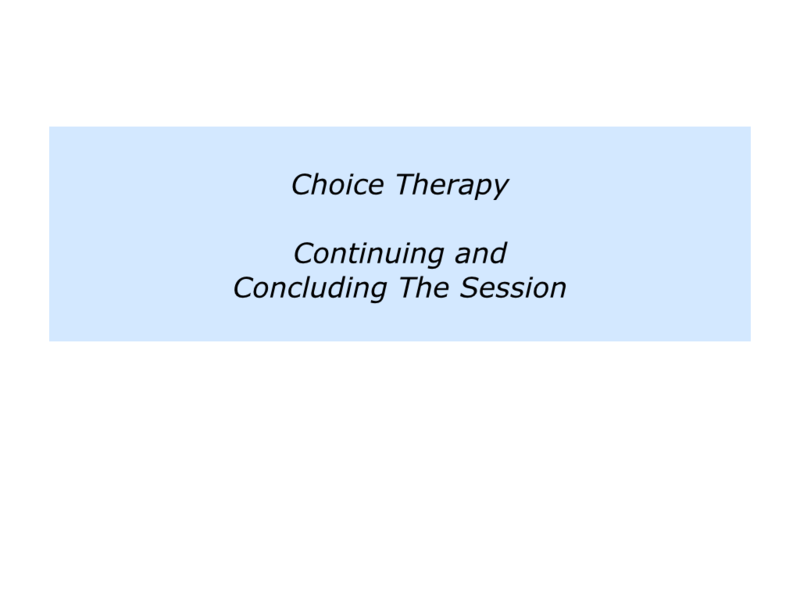 It obviously does not provide a qualification for actually practicing the therapy. Imagine somebody has asked for your help in tackling a specific challenge. They may want to take more control of their life, overcome a setback, tackle a particular problem or whatever. The first step is to have an informal conversation. You can invite the person to outline their goals and, if you are happy to help, explain your way of working. You can then ask the person to reflect on whether they would like to go ahead. To start by creating an encouraging environment. To welcome the person and make them feel at home. To invite them to again explain the reason they are looking for help. To explain what you can and can’t offer. To, if the person wants to proceed, make clear working contracts. To agree on your role and their role in working to achieve their goals. When working with a person, it is vital to accept their feelings are real for them, even though they might sound crazy to other people. This is the first empathy – showing that you understand the person’s actual situation. You will soon move towards the second empathy. This is focusing on the person’s aspirations – what they want to feel, do and achieve in the future. Let’s consider an example. Recently I worked with Dave, who felt overcome by pressure. He often broke into cold sweats, felt ill and got angry with loved ones at home. Certainly he could learn techniques for managing the pressure, but the causes were obviously deep. I explained we could achieve this short-term goal. If he wished, we could also focus on his medium and long-term goals. Dave said this would be useful, because he felt unhappy at work. We agreed on the contract. My responsibility was to listen and clarify his goals. It was then to provide support and tools he could use to succeed. His role was to shape his future and do whatever he felt appropriate to achieve his goals. Dave accepted there were no miracle cures and bought into the working contract. To state the goals in positive terms. 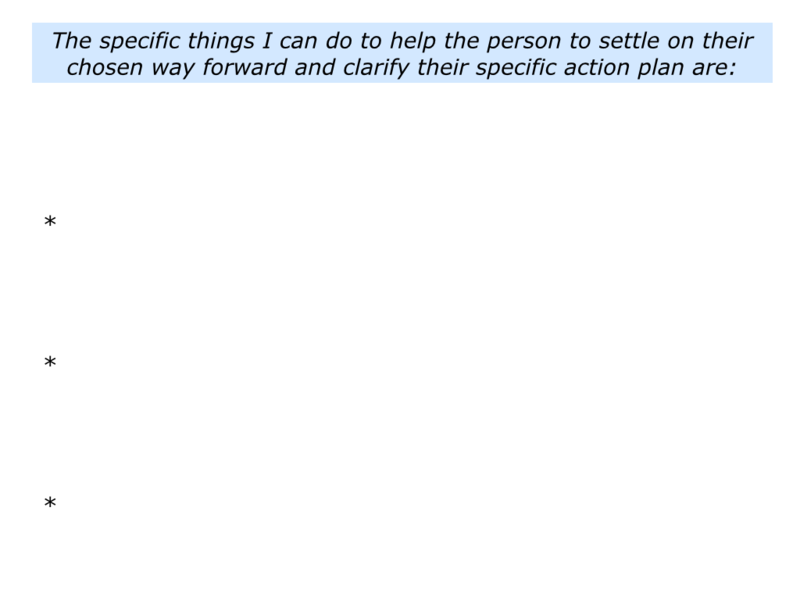 To clarify the person’s short-term goals but, if appropriate, also their medium and long-term goals. Dave wanted to focus on his life-goals. These included working in a culture where he felt at ease – one that was supportive yet stretching. To clarify the person’s controllables. A person can control their own attitude and behaviour, for example, but they can’t control other people’s opinions. They can obviously try to influence other people, but ultimately they cannot control what other people think about them. 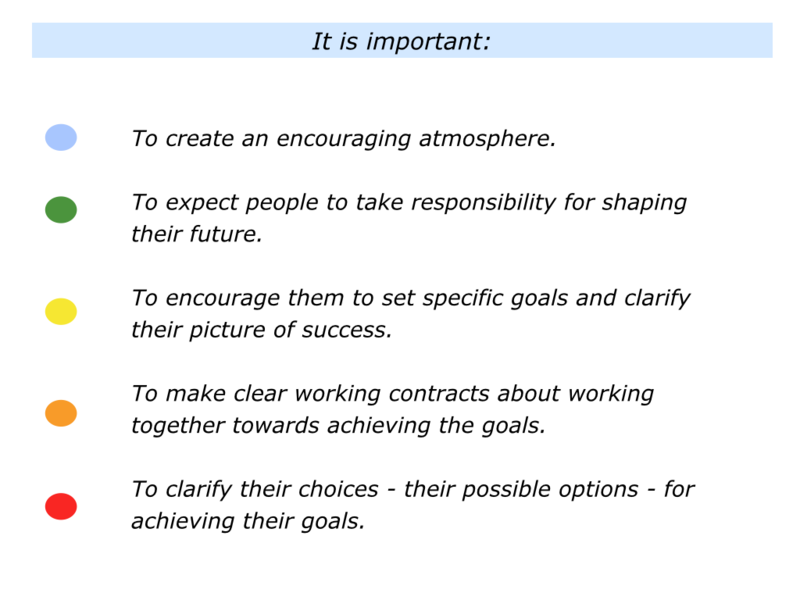 To revisit their goals and translate these into a clear picture of success. To, if they have several goals, list these in order of priority. To then focus on the first topic they want to tackle. Certainly this sounds logical. But it must be done in a warm and encouraging way. You then have the basis for working well together. Imagine you are conducting such a session. If you wish, try tackling the exercise on this theme. 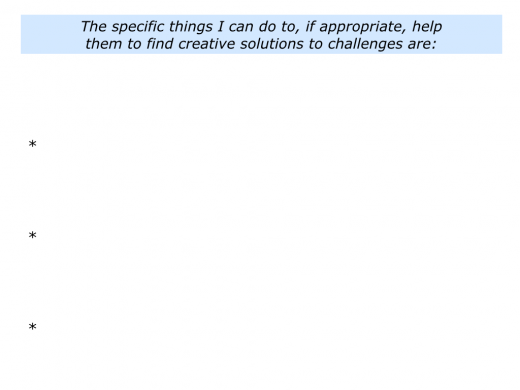 This invites you to describe the specific things you can do when starting a session. Start by tackling the first goal. Invite the person to consider all the potential routes they can take to achieve success. Whenever possible, draw these out from the person. Looking at the goals you want to achieve, there are many different strategies you can follow. 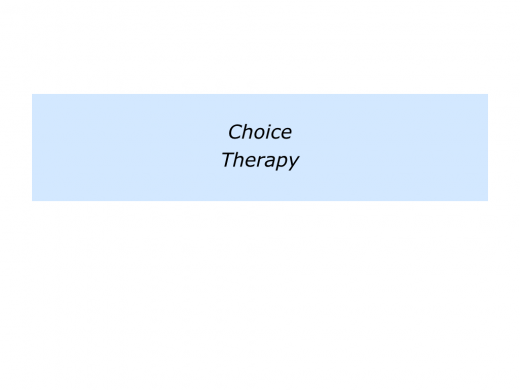 Option A is to …. There are probably many more options, some of which we will explore in a moment. Each route has both pluses and minuses. 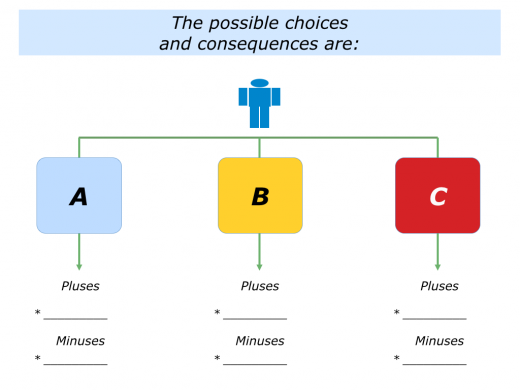 Some options are more attractive than others, but ultimately it is going to be your choice. 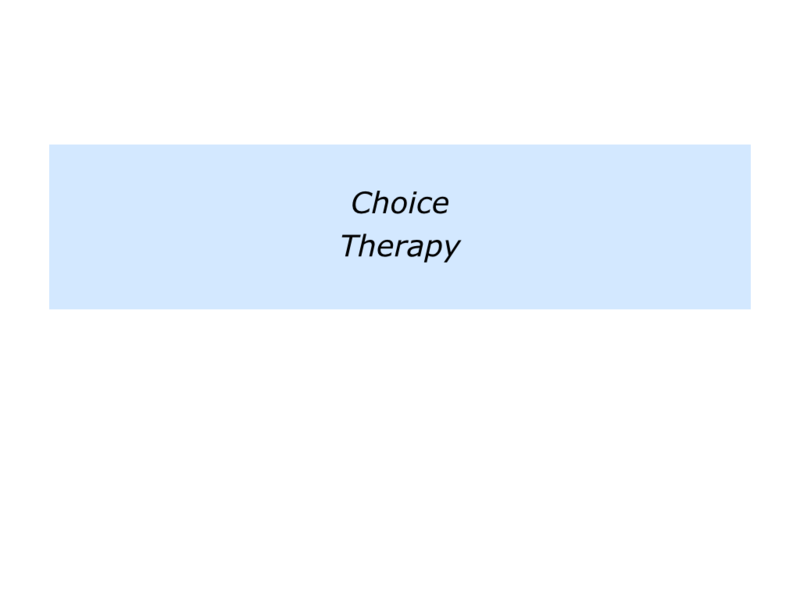 Which of these options is the most attractive? We can explore this further. Or, if you wish, we can look at other possible creative solutions. If appropriate, you can also share other potential routes. This is an opportunity to share your knowledge. You can, for example, offer positive models and practical tools they can use to achieve their goals. When doing this, watch the person to see which ideas resonate. 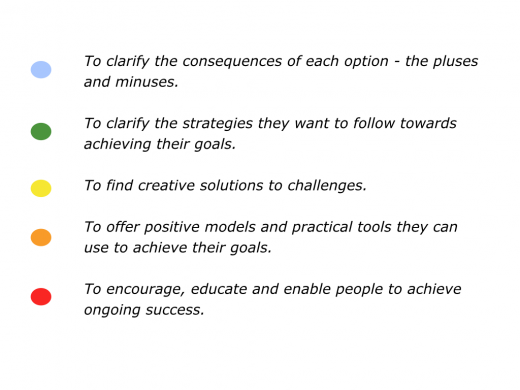 They may then wish to add these to their strategies for moving forward. There are many approaches to exploring creative solutions – such as brainstorming, sharing practical tools, exploring successful patterns or whatever. 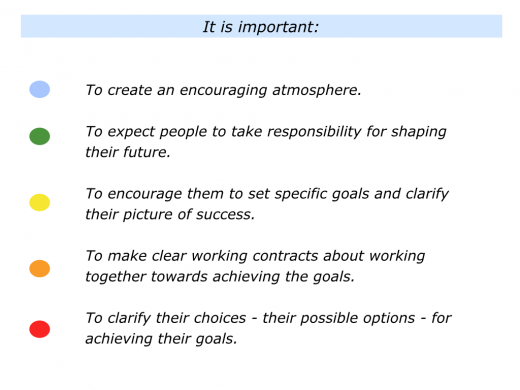 Return to the beginning and clarify the goals they want to achieve – the ‘What’. Be positive and encourage the person, but do not try to persuade. The person ultimately has the right to behave as they wish. There will be consequences, of course, both for themselves and other people. 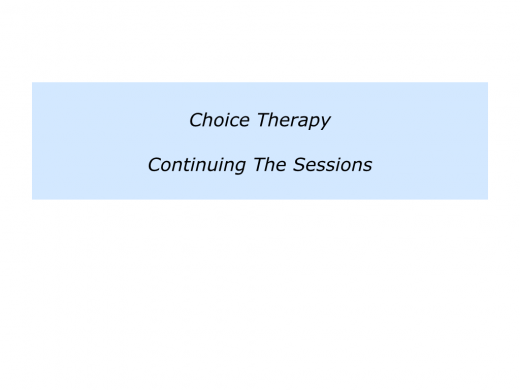 Returning to the session with Dave, I invited him to explore his positive history. Looking back at his life, when had managed pressure successfully? What had he done right then? How could he follow similar principles in the future? Fifteen minutes later he had clarified his successful pattern and translated this into an action plan for staying calm. Dave’s key issue revolved around feeling in control. This was exemplified in difficult meetings at work where he felt attacked. Looking ahead to the next such meeting, we clarified the results he wanted to achieve and rehearsed tackling the actual situation. Dave felt good about his strategies, but was still concerned about losing control. So he made an action plan for staying calm. This involved taking the following steps. To recognise the potential warning signs. Such as starting to feel distant and dizzy, which then led to cold sweats. To implement his successful pattern for staying calm. This meant buying time by, for instance, getting a cup of coffee, breathing calmly and clarifying the results he wanted to achieve in the situation. To be calm, speak slowly and try to find positive solutions with the other people. If this was not possible, instead of being rushed into a decision, he would promise to get back to them with suggestions. Dave and I role-played the situation and kept going until he felt satisfied with his chosen strategy. We then moved onto the next topic to explore. He wanted to find a stimulating role in a supportive yet stretching culture. 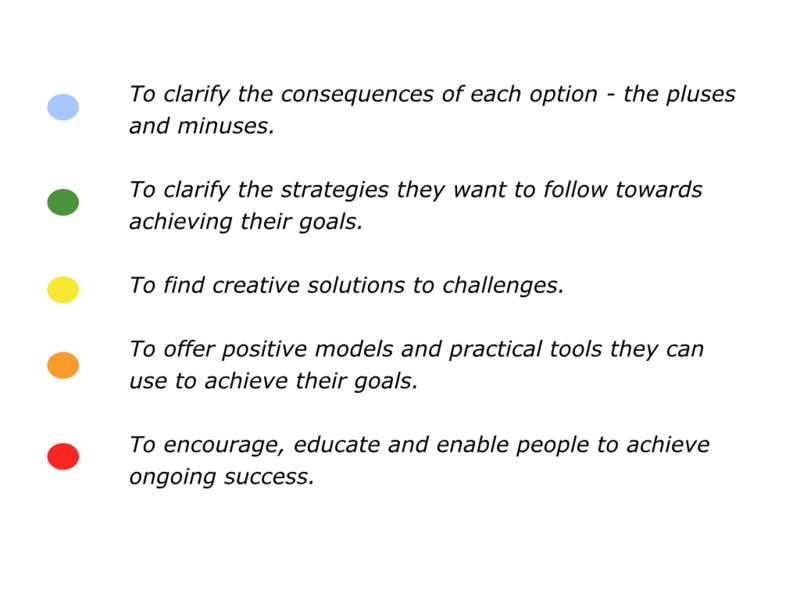 If you wish, try tackling the exercise on this theme of exploring the potential ways for going forwards. This invites you to do the following things. 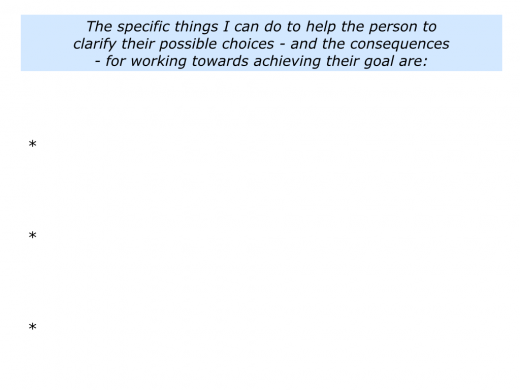 Describe the specific things you can do to help the person to clarify their possible choices – and the consequences – for working towards achieving their goal. 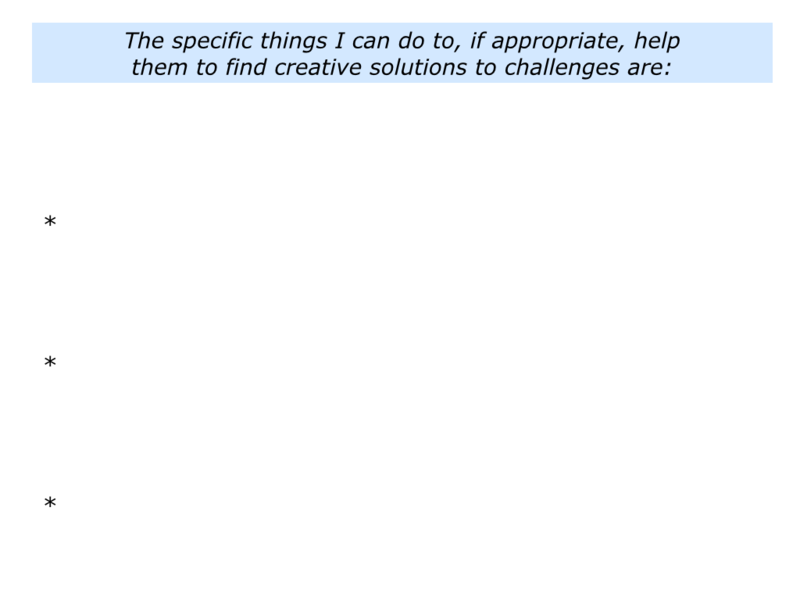 Describe the specific things you can do to help them to, if appropriate, find creative solutions to challenges. Describe the specific things you can do to help them to settle on their chosen way forward and clarify their specific action plan. Imagine the person has put their action plan into practice. Start the second meeting by clarifying what they want to explore – their desired take aways from the session. The things they did well. The things they could do better next time. The things they have learned and can apply in the future. 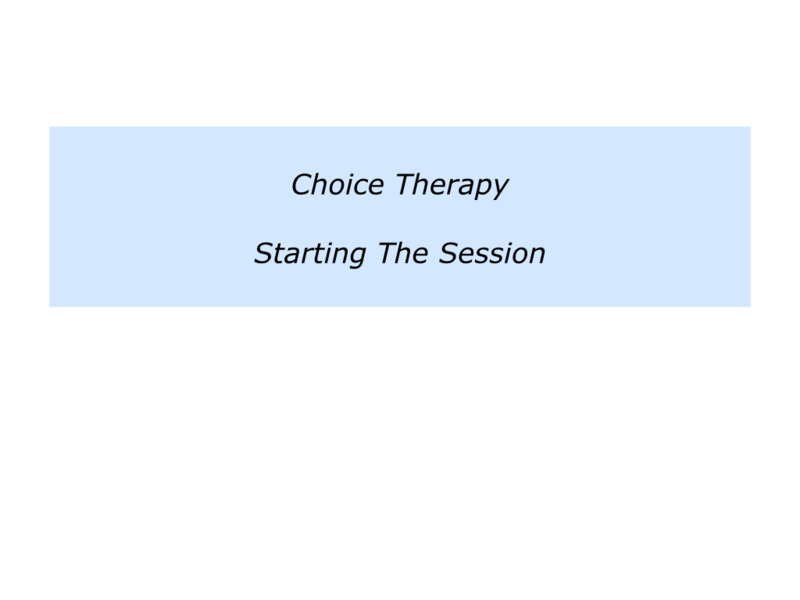 You can then move into the first topic they want to explore in this second session. 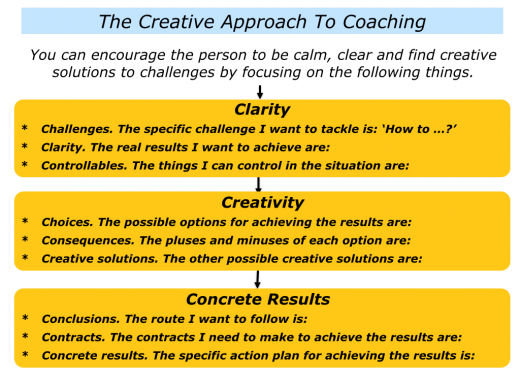 If appropriate, you can use the creative approach to coaching. 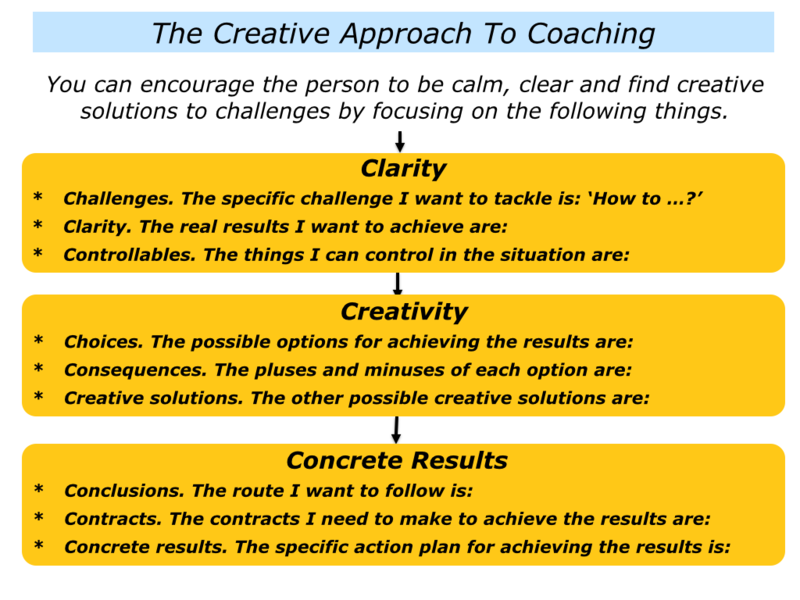 You can help the person to focus on clarity, creativity and concrete results. Choice therapy starts by providing a caring environment. It then involves helping the person to clarify their goals, explore the potential choices, consequences and find creative solutions. The key differentiating factors, however, stem from the basic assumptions about people. These include encouraging people to take responsibility, be creative and pursue their chosen strategies. It is then providing support that enables them to achieve ongoing success. If you wish, try completing the final exercise on this theme. 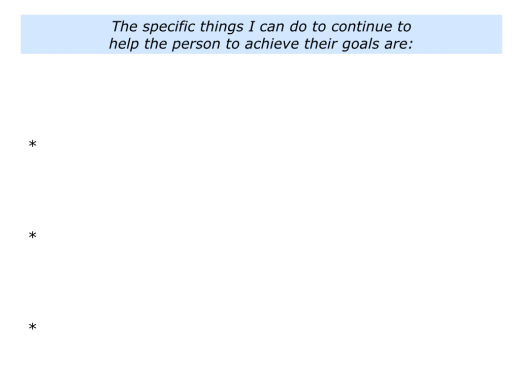 This invites you to describe how you can continue to help the person to achieve their goals.